We would have observed children playing with kitchen sets and replicating the routine of their parents in the kitchen. While some children like to observe their parents cooking, some others like to help their mothers in the kitchen. 1. Keep away the knives and other sharp objects. Teach them how to use a sandwich knife to cut only soft vegetables like tomato, cabbage or capsicum. Avoid potatoes and carrots as these vegetables need a sharper knife. 2. If you are cooking a deep fried food, keep your child away and get them involved with something more creative like cutting fruits and vegetables in different shapes. Learning to cut chapathi/puri dough in alphabetical shapes/ circle/square etc can help in motor development too! 3. Practice wearing an apron and tell them why it's necessary. Guide your child not to wear anything that's big and loose. Baggy sleeves or clothes could catch fire or get caught in mixer beaters or other equipment. 4. Learning to cook healthy is a part of practicing safety habits in the kitchen. Always wash hands with soap and water even before you begin cooking. Keep the cooking vessel clean and dry. After use of each utensil, wash them with soap water. These kinds of small practices would keep germs away and promote healthy cooking habits. 5. Use potholders/tongs when handling hot pots, pans, or baking trays. No dish cloth is advised. Keep the hot vessels away from where your child is. 6. Make sure pot handles and other handles are turned away from the front of the stove, so they don't tip over by mistake. 7. Make sure there is no water on the floor that has fallen by mistake, as this can lead to accidents and falls while working. 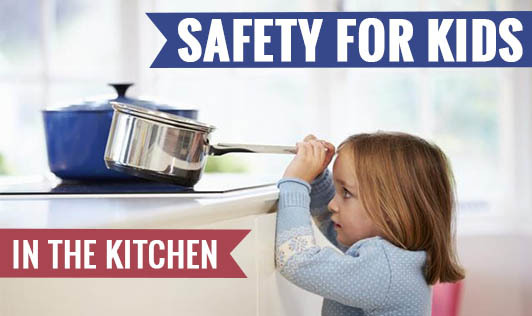 These are a few tips to make sure your child is safe in the kitchen. Enjoy cooking together!